One way of providing fiber to the home is through a Gigabit Passive Optical Network, or GPON. 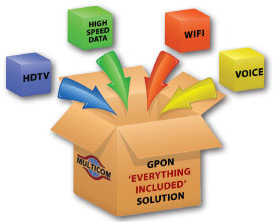 GPON is a point-to-multipoint access network. Its main characteristic is the use of passive splitters in the fiber distribution network, enabling one single feeding fiber from the provider to serve multiple homes and small businesses. GPON has a downstream capacity of 2.488 Gb/s and an upstream capacity of 1.244 Gbp/s that is shared among users. Encryption is used to keep each user’s data secured and private from other users. Although there are other technologies that could provide fiber to the home, passive optical networks (PONs) like GPON are generally considered the strongest candidate for widespread deployments. Dasan Zhone is a global leader in delivering carrier-grade network and customer access solutions for high-speed data, voice, video, and wireless services over FTTP (Fiber-to-the-Premise) networks, with more than 5 million ONTs deployed worldwide. GPON is specified to be a single or dual fiber system, but almost all GPON systems are single fiber like virtually all popular FTTH technologies. There is little reason to use dual fibers, although this option is indeed allowed in the standard. The RF overlay incorporates standard and high definition video into the fiber network using the 1550nm transmitter and EDFA. For cost savings, this topology is often used over the GPON IP solution.